These Shaker-style internal bifolding doors are an attractive and contemporary solution to expand and enhance your living space. These doors are finished with a high quality white primer which some of our customers have been so impressed with that they’ve installed the doors as they are, rather than painting them. Featuring 4 clear glazed panels, these folding doors are perfect for both modern and more traditional homes and allow plenty of light to filter through; transforming even the darkest of rooms. When not in use, these doors simply fold out of the way, allowing you to make the most of the available space; perfect for entertaining. Available in 3, 4, 5 and 6 door configurations with 1’9”, 2’0” or 2’3” wide doors, getting the perfect fit for your home has never been easier. To find out more about these doors, simply select a product below to discover technical specifications and more production information. 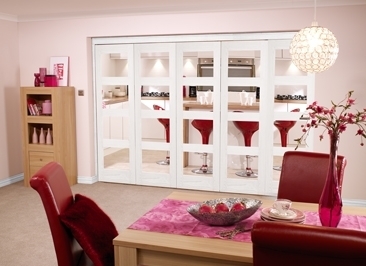 The set comes with unfinished frame, hardware pack and preglazed 4 light shaker white primed doors. This set excludes drop bolts and handles allowing you to match the colour of your existing ironmongery.